Kuklo left the walls behind for one reason: to see a Titan for himself, and finally banish the doubts that have dogged him about his own humanity. That mission has been accomplished, but not everything has gone according to plan. 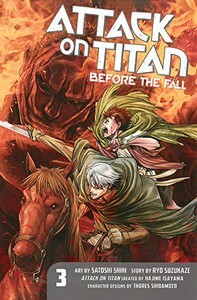 Now Kuklo is on the run with the Survey Corps from a 10-meter-class Titan. But it soon becomes clear to Kuklo and Commander Pikale that they have no chance to reach the wall in time. To live, they'll have to fight!